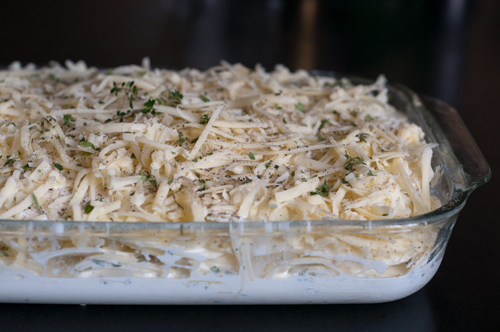 I frequently make a potato gratin – a potato casserole with elegantly layered thin slices of potato, heavy cream, and a topping of cheese – for special meals or events I’m catering. It’s pretty when sliced, it’s decadent, and it can be made ahead and reheated. Imagine relaxing on Thanksgiving instead of cooking all day, right?! Well last week as I was making this for a catered party that was to be held the day after I moved my mom into assisted living (an 8 hour, storm the place, family effort to get her moved that left me mentally and physically exhausted), I just didn’t have the time or energy for meticulously layering the potatoes and other ingredients to create the gratin the way I usually do. And then, in a moment of exhaustion or brilliance, an idea came to me. In all fairness, I shouldn’t claim this as my own brilliant idea. What actually happened is that a memory of watching Ina Garten on The Barefoot Contessa years ago popped into my head and I remember her just dumping everything into the dish to bake. 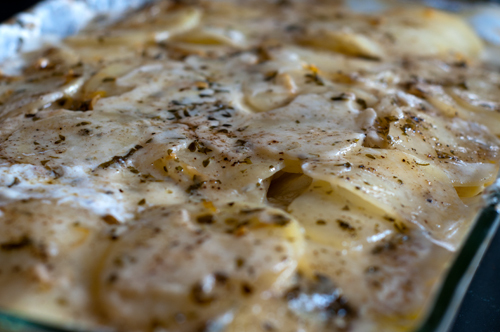 Sure enough, if you thinly slice the potatoes into a bowl of cold water (to keep them from browning while you work) and then drain them and toss them with the cream, you can dump the whole thing into a large baking dish and press them down into a layered dish like this just as easily. Whew – that sure made my day easier last week, and I’m hoping it might make your holiday easier too. Spray a 9 x 13 glass baking dish with cooking spray and pour the potatoes into the dish, spreading into an even layer and pressing down to remove any air pockets. Top with the cheese (and an extra sprinkling of thyme if you like) and cover with foil you have sprayed with cooking spray (to prevent sticking). Bake at 375 degrees until the cream has thickened and the potatoes are cooked through, about 60-90 minutes, removing the the foil for the last 15 minutes of cooking to brown the top slightly. Let stand for 10-15 minutes before slicing and serving. You don't want too much heavy cream in your dish or it will never cook up and thicken. Better to toss the potatoes with the smaller amount of cream and drizzle a little more over the top if needed than to douse them in cream. Once the layers of potato are pressed into the baking dish, the cream should not come more than ⅓ of the way up the side of the dish - if you have too much cream, pour a bit off before baking. Gosh I love au gratin potatoes. Never one to leave things alone, I started adding a bit of cheddar and bleu cheese along with some bacon and lots of onion. We only have them once or twice a year and boy do we savor every bite. I love the idea of just mixing them up. That is a real time saver. this sounds good but I don’t understand why it is considered lazy….. it’s pretty much how most recipes read? I was taught in French cooking classes to painstakingly layer the potatoes and drizzle cream on each layer – tossing and dumping is definitely the “lazy” way! Can this be assembled the day/night before you want to bake it, and refrigerate overnight? I’ve made this the day I want to serve, but never the day before. It is delicious!! I’ve used shredded gouda cheese in place of gruyere and it’s fabulous (and a time saver since the cheese comes shredded!)! Cathryn, I have tried making this the day before, but the potatoes tend to brown, even though coated with the cream. You could slice the potatoes the day before and keep them in cold water in the refrigerator so that your ready to go, but I’d advise you to assemble right before baking.